Silver sulfadiazine is an antibacterial drug used for making personal care products. Silver sulfadiazine is listed as the essential medicines by World Health Organization and is widely used as an antibiotic for treating second and third degree burn wounds on the skin. Silver sulfadiazine also helps in preventing the growth of bacteria and yeast on the skin. Silver sulfadiazine is also commonly used to treat urinary tract infections (UTIs). Sulfadiazine, when combined with pyrimethamine, is used for curing the disease Toxoplasmosis. The healing capacity of silver sulfadiazine has been questioned over and again by various researchers and numerous research studies. Despite varied market opinions; silver sulfadiazine remains to be one of the most popular medicines for treatment on burns as it’s is considered to be a powerful medication for burn wounds. Additionally, silver sulfadiazine is used in majority of the hospitals in North America as it is considered the most powerful treatment for burns. Globally increasing incidences of the burn injuries and increasing adoption in developing nations is expected drive the global demand for Silver sulfadiazine during the period of study. Geographically North America dominated silver sulfadiazine market driven by best in the class healthcare infrastructure, advanced facilities, higher awareness, higher technological penetration and higher spending by the citizens towards healthcare expenditure. 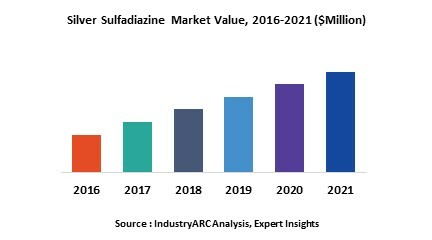 North America was followed by Europe and Asia-Pacific as second and third largest market for silver sulfadiazine market. Asia Pacific is projected to have fastest growth, owing to rapidly increasing healthcare infrastructure, increased spending, government initiatives and increasing awareness amongst population, and growing medical tourism industry in developing nations such as China, and India in this region. This report identifies the global silver sulfadiazine market size in for the year 2014-2016, and forecast of the same for year 2021. It also highlights the market drivers, restraints, growth indicators, challenges, and other key aspects with respect to global silver sulfadiazine market.